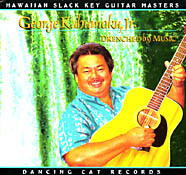 He's been called Hawai`i's Renaissance man: George Kahumoku Jr., master slack key guitar player, songwriter, world-wide performer, high school teacher, former principal, sculptor, story-teller and a farmer so in tune with his islands that he has won several state and national awards for his work with the land. George began playing music professionally at the age of 13 with the legendary singer/songwriter Kui Lee. 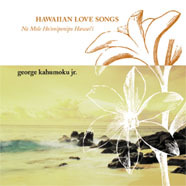 After graduating from Kamehameha Schools in 1969, George earned a BFA degree at the California College of Arts and Crafts in Oakland, California. Following a stint working on the Alaska pipeline, he returned to Hawai`i and plunged into farming and community efforts such as working with children in native language skills. He currently lives on Maui where he teaches and farms.